Thank you for being an advocate for the infertility movement. Coming to Washington, D.C. to meet with your elected officials is an empowering experience. RESOLVE wants to give you all that you need for “the before”, “the during”, and “the after” of Advocacy Day. Read on to find resources and materials that will help you prepare for Advocacy Day. Read the FAQs. Learn more about what you can expect on Advocacy Day. Book your travel. We suggest reading up on the schedule of events and details about the Capitol Hill and surrounding areas. You can find more travel information here. And if you need budget-friendly travel tips, read this article from one of our advocates. Connect with others. RESOLVE has a very active Facebook group for advocates just like you. You must request to join the group. This is a closed group so only you and the group members will see the posts. Be proud you’re an advocate! Help us share information about this important event on your social media networks. Ask for support! Letters from friends and family to their Members of Congress are an easy way to bring more voices of support with you. Click here to find the Google forms to submit letters to Congress. Attend an online training. 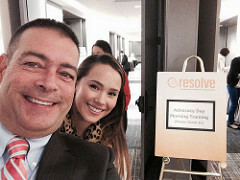 RSVP for an online training session from the RESOLVE Advocacy Day Team. The recorded online training for Advocacy Day 2017 can be found here. Get to know your Members of Congress. It’s important to know who your Members of Congress are, how they vote, and a little bit about their personal life. Find out who your Members are and visit their websites by using OpenCongress.org. Follow the "Create Change!" blog: This blog series is the brainchild of the Advocacy Day 2017 Training Co-Chairs, Annie Kuo and Kelly Garrity. Look out for a new post every Friday. RSVP for ASRM Advocacy Academy. This event has reach capacity and we are no longer taking RSVPs. Review important documents. Feel prepared by reviewing these documents ahead of time. No need to print these materials because they will all be in folders you receive at the Advocacy Day Morning Training. We will be updating this page with documents as we get closer to the event. Download the Advocacy Day Spotify playlist. Get pumped for a day on Capitol Hill. Watch this mock congressional meeting. Thank you to Kate Weldon LeBlanc, Executive Director of RESOLVE New England and fellow staff for helping to create this video. Be an Advocacy Day "Spy"! Complete the Spy Sheet for Advocacy Day. This 4-point worksheet has everything you need to collect essential "intelligence" about your state and your lawmaker. How many people with infertility live in your state? How many Veterans? Guarateed to double your effectiveness on Advocacy Day! Use this 4-point worksheet. Call Congress! It's most effective to call Congress 10 days to a week prior to Hill visits. Give the Members and Staffers a heads up about our issues and that you will be meeting with them on Thursday, May 18th. Use these phone scripts. How to call Congress tips. How to call your Reps when you have social anxiety. Meet your state captain/s and fellow state advocates. You will have the opportunity to meet your state captains during the Welcome Reception. Also, once you check-in at the Morning Training on Advocacy Day you will be seated by state. Your fellow state advocates will be with you for the majority of the day so introduce yourself and connect with your state captains. Rehearse your story. Think about how you will tell your story. Keep it simple as often the people you are meeting with are unfamiliar with the complex details of medical treatment or the full spectrum assisted reproductive technology and/or the adoption process. Make some notes so you don’t forget the parts you want to mention. It’s helpful to share your out-of-pocket expenses. Explain how financial assistance would help you and others make more appropriate decisions. Examples include better diagnostic testing, earlier treatment, and more appropriate treatment, recovering costs from adoption, surrogacy and being able to afford another adoption or IVF. Read through the materials. RESOLVE will provide you with packets of important information to keep with you during your appointments. RESOLVE will also provide these materials ahead of Advocacy Day. Make sure you read through the issues we are advocating so they are fresh in your mind. Take Notes. We will provide you with a document so that you can take notes during your meetings. Things to note: Did the office you met with support our issues? Or were they just neutral? Did they have any questions? What type of questions did they ask you? Get a business card. You are going to want to follow up with the offices you meet with on Advocacy Day. Make sure know the name of the person you are meeting with and you get their contact information. You will want to personalize your thank you notes that will be sent post event. Snap a pic. Take a selfie with the selfie signs in your day of packets. Post them to social media and tag @resolveorg with the hashtag #IFAdvocacy. Find your Members of Congress on social media and tag them too. Advocates have been nkown to run into Members of Congress or celebrities on Capitol Hill. If you ask polietly, some are will to give you a photo op! Only tag others if you have their permission. Find the Advocacy Day social media guide here. Stay connected with your Members of Congress. That includes their staffers. Read about why staffers are just as important as meeting your Members of Congress. 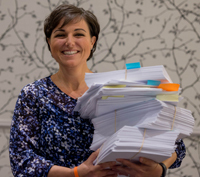 Make sure you send thank you letters soon after Advocacy Day. Your thank you letter can serve as a reminder and another opportunity to ask your Members to support our issues. A lot of Members of Congress have social media pages. Follow them and send a thank you. Write your own personalized thank you note or use these template thank you letters: Senate Thank You Letter and House Thank You Letter (Updated letter templates coming soon). Did your lawmakers have questions? Please send the information to sbookal@resolve.org and we’ll respond. Stay connected with other advocates. You now have travel buddies for the next Advocacy Day and new relationships with advocates in your home state. We encourage you to get involved with state level grassroot advocacy as a team and continue the Advocacy Day spirit on the home front. Learn more about RESOLVE's grassroot program, Project PROTECT. Give us feedback. We want Advocacy Day to improve every year and we need your valuable feedback. Please fill out the Evaluation Forms (Updated evaluation forms coming soon!) Please send your evaluation form to Simmy Bookal via email (sbookal@resolve.org), mail (7918 Jones Branch Drive, Suite 300, McLean, VA 22102), or fax (703.506.3266). Check the RESOLVE Advocacy Day website. We’ll post the new co-sponsors and actions on the bills and issues. We’ll have prompts to send more notes regularly if your lawmakers need more prodding to get on board. Share your experience. Share your photos and stories in the Advocacy Day Facebook group or send to RESOLVE at info@resolve.org. If you have a blog, write a post about your Advocacy Day experience and share it with us.